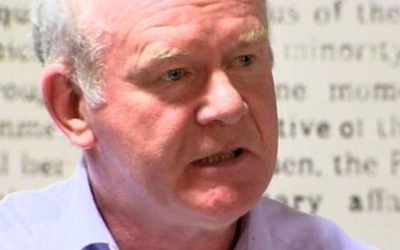 In a wide-ranging interview with Liam Clarke of the Belfast Telegraph, Sinn Fein’s Deputy First Minister Martin McGuinness insists that a united Ireland is inevitable. Q. If [candidate for leadership of the British Labour Party] Jeremy Corbyn becomes Prime Minister what would you expect from his government? A. I very rarely deal in ‘ifs’. I prefer to deal in certainties and there is no certainty about who is going to be the next Labour leader on September 12 never mind the next Prime Minister in five years. I have long since learned that you have to play the hand you are dealt and the hand we have is a Conservative government with an overall majority for the next five years. A lot of Labour people are telling me that Labour is in poor shape. Given that Jeremy has been a very good friend of ours for many years, we obviously wish him well and await with interest who emerges as leader. Q. Would you favour taking seats at Westminster if there is a left-wing Labour government who needed support? A. No. Our position has been on the record for many decades and I don’t envisage any change whatsoever; there is no mood for it within the party. Quite apart from the principle involved it could damage the cohesion of mainstream republicanism. I think that is not something that a leadership that has been very precious about cohesiveness would contemplate. Q. You mean there would be too much of a kickback? A. That is not the reason. The reason is that we have a principled republican position. Politicians are criticised left, right and centre for not having principled positions but on this matter we don’t see any advantage in change either. The negotiations that I have been involved in with successive British Prime Ministers over the the last 20-odd years have borne more fruit than me being the MP for Mid Ulster. I had more access than many Labour and Conservative backbenchers had. Q. What about the legacy of the past? Can it be handled by agreement? A. There have been ongoing party leaders’ meetings and they are continuing right through August. Considerable progress has been made on how to deal with the past. That means putting in place the structures and mechanisms. It will take #30m each year over five years but some think that won’t be enough to deal with the challenges. The British government has come under direct criticism from Europe for not moving fast enough and not providing the level of funding required to finance the menu of options victims are entitled to. The fact that Peter Robinson and I have appointed Judith Thompson as the new Victims Commissioner a couple of weeks ago sent out a very clear signal that we need to push on with this business to ensure that victims’ needs are being satisfactorily met. Q. Do you expect it to happen in September? A. I hope that in September we will see a resolution to the difficulties that we have faced flowing from the Stormont House Agreement. I think it is very important to say that even if we don’t see a resolution to those difficulties the issue of how we deal with the past still has to be settled. There is a huge responsibility on the British government to ensure that what was agreed at Stormont House is implemented. I am aiming for a comprehensive agreement. I am not aiming for an agreement on how we deal with the past, or how we deal with the issue of parades or the issue of flags, symbols and identity and the pressures on the Executive. The way in which the Tory administration are targeting some of the most vulnerable, marginalised and disadvantaged and disabled people within our society. The challenge is how we meet those needs. They go right across the community. They affect people in Portadown, Coleraine and east Belfast as much as they affect people in the Bogside or Maghera or west Belfast. On top of that you have the whole issue of cuts to departmental budgets. That poses huge problems as does the targeting, in the recent budget, of people who I would describe as the working poor. Q. Theresa Villiers says there is no more money for welfare and the British government won’t subsidise you to run a more expensive welfare system than Britain has. What are the chances of that circle being squared? A. Look at the solutions I have been part of over the last 20 years. People said there would never be an IRA ceasefire. People thought that the issue of weapons wouldn’t be dealt with. People thought Sinn Fein would never take their places in the administration in Stormont. Some claimed Sinn Fein would never sign up to the new dispensation on policing. All of these posed massive challenges for republicans. We are now faced with another huge challenge but the interesting thing is that this isn’t an argument around Britishness or Irishness, around unionism, loyalism, nationalism or republicanism. This is an argument over how this Tory administration with its austerity agenda doesn’t appear to appreciate, thus far, that we are a society emerging from conflict and that we have special needs. I made this point to David Cameron when I met him in the House of Commons a couple of weeks ago. If you look at the amount of money that the British government poured into the north of Ireland during the time of conflict, billions of pounds, and you look at what is required to resolve our difficulties it is really only a drop in the ocean. Q. So that is the solution? More money from London. Is there any prospect of Sinn Fein modifying its position as Syriza did in Greece? A. As you said, the British government position as expressed by Theresa Villiers is “no more money, no more money, no more money”. Yet they are going to take more money off us in the autumn of this year. The British government has to face up to the impact of that on an Executive that has tried to lead a society that is emerging from conflict. I am not going to give my hand away at this stage. There are discussions around how the British government could be creative and flexible and I think that the argument isn’t falling on deaf ears. The other important thing about all of this is that I am not at odds with unionist colleagues in the Executive. I am at odds with the Tories. Q. The DUP are critical of you. They say you broke your word on welfare deals. That surely speaks of bad relationships in government? A. One thing I have been very conscious of over the course of the last 20 years is not to break my word. I don’t break my word and whenever we concluded the Stormont House Agreement much of it was done between the DUP and Sinn Fein. Other parties, of course, were involved and then there was confusion. But there was no confusion in my mind whenever Conor Murphy, in the immediate aftermath of the Stormont House Agreement, made it clear that our position was that we would fully protect those people who would have payments damaged by the approach of the British government. Not one unionist politician, not one member of the British government, contradicted what Conor Murphy said. So we end up with a situation where there is confusion. In March, Peter Robinson and I had a day-long engagement around finding a way forward. We agreed what that way forward could be. Thus far there have been difficulties in trying to bring that to a conclusion but there are ongoing discussions taking place and this isn’t about one-upmanship. This is about trying to put together an agreement which everybody can live with. Q. What are relations like with Peter Robinson? A. Well, I have never had a bad relationship with Peter Robinson. There are colleagues of yours in the media, and they are a tiny minority, who use phrases like ‘they hate one another’. I don’t hate Peter Robinson and I don’t think Peter Robinson hates me. We have worked together in the Office of the First Minister and Deputy First Minister since 2008. This is 2015. If relationships were as bad as they are portrayed, then I don’t think the institutions could have survived so long. I understand where Peter is coming from. I think Peter understands where I am coming from. My view is that we are both trying to do our best. Q. What happens if Peter Robinson retires before the next election? A. It is pointless speculating about other people’s plans. I will work with whoever is leader of the DUP. I have been honoured to work with both Ian Paisley and Peter over several years but do you think we agreed on everything? No, they have their own allegiances to what they call the United Kingdom. My allegiance is to Ireland. Yet we are in government together delivering important agendas for citizens. We have come through what has been the worst economic downturn in history. Our visits to the United States have brought huge benefits by helping attract foreign direct investment on a scale not previously seen in the north of Ireland. We have steadily reduced unemployment figures over the past couple of years. I think that and dozens and dozens of other decisions that have been taken have been actually good for society here. Q. It seems to me from what you have said that you are not offering any flexibility on the part of Sinn Fein. You are saying the British government has to be flexible in how it gives money. A. No. What I am saying is that in trying to find a way through the present difficulties there is a duty and responsibility on all of us. I am not placing the responsibility just on the British government. I think that we all have a responsibility to deal with the difficulties which we face because of a very clear agenda from the British government which is, to use the words of a former member of the same cabinet that David Cameron sat on, about destroying the Welfare State. Q. But they got a majority so it is hard to stop them. A. We have to try and find a way forward. I think that some of the comments that have been made in the course of the past couple of weeks by people within the British government gave some indication that they recognise that we are going to have to forge an agreement which they will contribute to. How they contribute to it, of course, will be the trick. Q. Are you suggesting that they give money for something else that will free up our budget for welfare? A. I won’t go into any detail on how we negotiate these things but you are around an awful long time. When I use phrases like “people need to be creative and imaginative” and whenever the Taoiseach goes to meet David Cameron and agrees with me, that shows that the British are getting clear messages from a lot of people about the need to contribute to a resolution of this difficulty. Q. You were in America. The DUP said you were wasting your time but Theresa Villiers didn’t agree. Do you think you have made any progress there? There was no statement from the US administration. A. The person who said I was wasting my time was Arlene [Foster the Finance Minister]. With respect to Arlene I am the best person to judge whether or not I have wasted my time and the Americans are the best judges of whether they were wasting their time in meeting me. A. I met with Mike Carpenter who is a very senior official within Joe Biden’s office. [Joe Biden is Vice President; Mike Carpenter is Special Advisor for Europe and Eurasia]. I met Drew O’Brien [Special Representative for Global projects at the State Department] and I met Katie Nutt [Ireland desk, State Department]. Drew O’Brien as you know is a very, very close associate of the Secretary of State John Kerry. I thought it was a good meeting. Q. Have they promised to do anything? A. They have a major role and there is no doubt in my mind whatsoever that they are exercised about the present difficulties and that they want to see a resolution. I believe that message has been delivered everywhere. Q. What do you think should be done about funerals and parades with paramilitary trappings? A. People need to remain peaceful - people who are marching in protest and people who are protesting against them. In these situations there is a duty on everyone to obey Parades Commission determinations. There have been determinations that I was uncomfortable with but you can’t say one thing and do another. Unionist politicians sometimes like to get behind the microphone and make demands on the police. My view is that the way the PSNI have conducted themselves in these situations in recent years is something they deserve credit for. They don’t need politicians sitting on the sidelines making demands. However they police these situations, it has to be done in a way that ensures that people keep the peace. I don’t sense any desire within the higher echelons of policing for aggressive action. As a very senior former policeman [Alan McQuillan] said to the Belfast Telegraph recently, it is wrong to demand that people get stuck in. Q. So you say support the police, support the Parades Commission. Q. What did you think about Peggy O’Hara’s funeral? A. The police handled it well. There was no public disorder. The sight of people in masks marching in the numbers that they marched in in the streets of Derry was more about their agenda than it was about honouring Peggy O’Hara. Q. Do mainstream republicans use masks in colour parties or commemorations any more? A. What is the point in it? The people who were marching at Peggy O’Hara’s funeral gave the impression that they were associated with the INLA which is supposed to be on ceasefire. I ask if they could have honoured her in a more dignified way. Q. Sinn Fein used to hope for a united Ireland in 2016. What are the prospects? A. I believe a united Ireland is inevitable. I have never put a date on it. The Good Friday Agreement makes it clear there will be no change in the constitutional position without the support of a majority of people in the north. I am working to bring that about. It will happen when it happens and in the meantime, we have to continue on the work that we are doing within the institutions. Q. Do you plan any more initiatives like meeting the Queen? A. The engagements I had with Queen Elizabeth and Prince Charles were about reaching out and showing respect to the unionist people. I also recognised that when someone like her makes acts of reconciliation as she did do at the Garden of Remembrance in Dublin, she is 100% behind the peace process. That creates a duty to continue to reach out in return. Often politicians are held back by voices nervous of these initiatives but we have a responsibility to provide leadership.